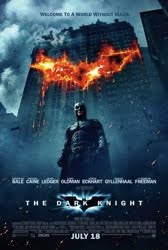 The Christopher Nolan lovefest continues as Patrick and Alex adopt their best scratchy voices and F the 2008 blockbuster The Dark Knight. It's better than going to a comic book festival. Check out the fan-made posters for Gotham City referenced in the show, as well as the fan film Batman: Dead End. So, I've only seen it once, but I also thought that Harvey's death was ambiguous like you did on your first viewing. Is there something I missed that definitively says he's dead and not just secretly stashed away at Arkham? I guess I'm just waiting for the top to fall, I mean, the body to show up. I had the same thoughts about Harvey still being alive and locked up at Arkham, but I think we're both using what Dileep Rao calls "negative evidence" -- we're basing that theory on things that are never shown. I think it would work so much better -- he would be just stewing away, obsessing on revenge but dead to the world -- but there's no way they could really do it. Imagine the reaction of the audience when it's revealed that he's still alive. Too big of a cheat, I think. If that's what they were planning, I assume there would have been some indication of it at the end of TDK. Unfortunately, I think he's gone and that they just kind of botched it. The top falls. I KNOW IT. Harvey Dent, Batman or...Jack Bauer?